Chinidere Mountain provides one of the best views in all of the hikes in the Hood Rangers District. When making plans to hike Chinidere Mountain, give yourself the full day; the drive from Portland is about 2 hours. The name Chinidere comes from the last chief of the Wasco Tribe prior to the Europeans arriving. The Wasco Tribe lived mostly east near what is now The Dalles in Wasco County. The tribe was closely related to the Chinookan Family, and the Wasco Tribe was sedentary, surviving on spring and fall salmon from the Columbia, and edible roots and berries. The views from the top of Chinidere are spectacular. The start of the hike is from the parking lot at Wahtum Lake campsite (Forest Service Pass Required). From the parking lot follow the 250-step stairway to the lake's edge. When arriving at the bottom take a moment to enjoy the beautiful lake. From here go left for about 100 feet and find the sign for the Pacific Crest Trail (PCT). Turn right here, heading north, you will go past a couple of backpacking sites, with the lake to your right. (Note; if you pass this turn the trail will begin to head uphill, time to turn around.) The first mile winds along the lake, through beautiful hemlock trees with all sorts of berry plants, including huckleberry, salmonberry, and bunchberry; columbine is also prevalent throughout this portion of the hike. After the first mile the trail starts a slight climb with a more open forest covered with beargrass, which blooms in July. The floor is covered with pine needles, which makes for easy hiking and the smell of fresh pine truly awakens the senses. After about a mile and three quarters, on your left, you will come to a dry creek. Be careful here; we got mixed up and wandered about a bit in the beargrass trying to find the trail. Once you cross the dry creek you will intersect the Herman Creek Trail. About 500 feet from here you will see the Chinidere Side Trail; continue past this cut off for a couple hundred feet for the Chinidere Mountain Trail. Leaving the PCT, begin your climb to Chinidere Mountain. This is the steep part of the trail, rising about 400 feet in about 1/3 mile, you will see the rocky summit ahead. After climbing to the top of what appears to be a big rock pile you will now enjoy the vistas all around you. Catch your breath for a moment, then sit back and enjoy the vistas. 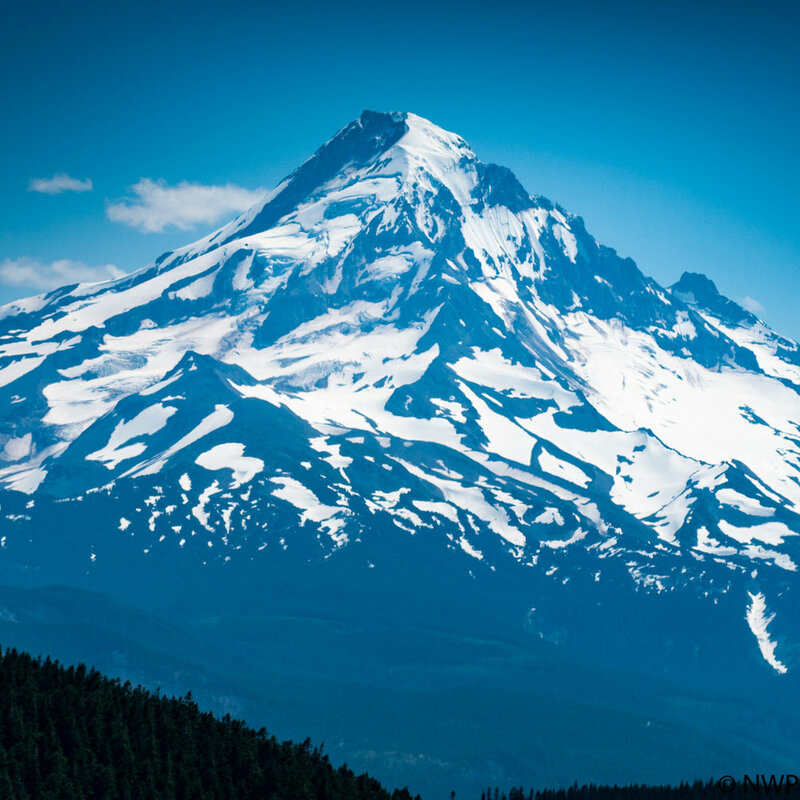 Mount Hood looms large, almost feeling like you could reach out and grab a handful of snow from the glacier. That's just the beginning; on a clear day, looking to the north you'll see Mount Adams, Mount St. Helens,and way off in the distance is Mount Rainier. You will get a great view of Wahtum Lake, and be able to appreciate the climb you have just made. Once you have gorged yourself on the view, it's time to start the trip down. After you make the initial steep descent and reach the PCT, bear left and look for the Chinidere Side Trail; take this trail back to the lake. It's a beautiful very heavily wooded trail and an easy walk. Along the way you will cross a few streams which feed water to Wahtum Lake. The trail approaches the lake from the opposite side and circumvents back to the stairwell, which leads to the parking lot. Be sure to allow time on your trip back to Portland to stop in Hood River. There are great places to eat and plenty of quaint shops along and just off Oak Street. Doppio Coffee is fantastic. If you have a taste for Thai, Lampoei's Thai Kitchen is the best,you'll find their trailer right off Hwy 35 in the parking lot of a building supply store, bring cash, credits cards not accepted. Another great choice if you're in the mood for a little fancier fare is Nora's Table on 5th street, Nora's uses a lot of local ingredients, plan on the meal taking some time, Nora's doesn't rush. Getting there, take I-84 east to Hood River Exit 62 turn rightonto Cascade Avenue, follow Cascade for slightly over a mile turn right on 13th street, follow 13th street through town it will merge with 12th and become Hwy 281. 281 will turn into Tucker Road, Stay on Tucker/281 and follow signs to Dee. Tucker will merge with the Dee Highway281. After merge follow Dee Highway for almost 6 miles, look for the signs for Lost Lake Road, slight right onto Lost Lake Road. Follow Lost Lake Road for about 6 miles,look for NF13 (it will be a slight right at the fork in the road). In about 4 miles the road changes to NF1310, travel about 6 miles further to the parking lot at Wahtum Lake.